The ability to jump well is critical in most sports. Not only is it important to be able to express full power potential but also to be efficient with proper jumping mechanics to ensure athlete safety. In sports like basketball and volleyball, the need for jumping ability and power is obvious. Other sports such as soccer, baseball, tennis, and football, jumping ability correlates with speed and explosiveness. 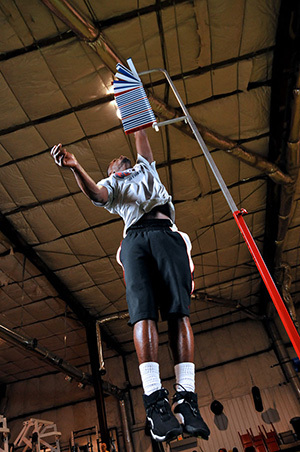 Titan’s Flight School takes a science based systematic approach to vertical leap development. Utilizing state-of-the-art equipment like the Vertimax, athletes will participate in the highest quality plyometric program that Tulsa has to offer. Improve volley specific power for an explosive vertical and fast twitch multidirectional movement! Morning, afternoon and evening session times available. Interested in a Flight School program specific to your sport? Contact the Titan staff.